The first train of the day departed Dublin at 10:50am, and was scheduled to do the journey out to Maynooth in about 45 minutes. 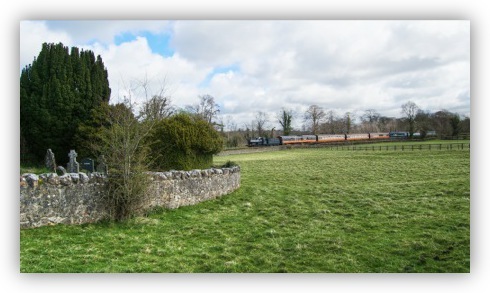 I decided to meet the train at my new favourite location, Donaghmore Cemetery, located a little east of Maynooth near Pike Bridge and milepost 13¼. The track runs on a slight embankment here, so you get a nice view of the trains with the old walled cemetery framing the left side of the shot. My plan was to shoot video and stills in the field next to the cemetery, and to set up my little GoPro camera next to the line on a little tripod. Things didn’t quite go to plan when I foolishly started to tinker with the settings on the GoPro (over a wireless connection) a little too close to the train’s due time. The train was 5 minutes early, and I missed the shot. 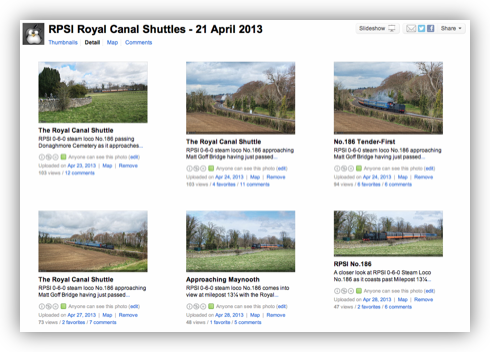 I did still get usable video and stills from the field, but no closeup of the train. I was also unlucky with the light, the forecast had been for wind and rain, but instead it was windy and partially overcast – the sun had been out until about 30 seconds before the train arrived, and this would be the pattern for the rest of the day. I wasn’t sure how long the train would stay in Maynooth before starting back towards Dublin so I didn’t want to move too far to capture the return leg. 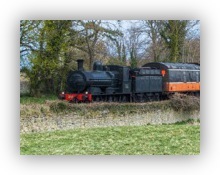 I decided to set up on Matt Goff bridge on outskirts of Leixlip village which gives a nice view of the line as it snakes down hill through the s-bends between Blakestown level crossing and the bridge. 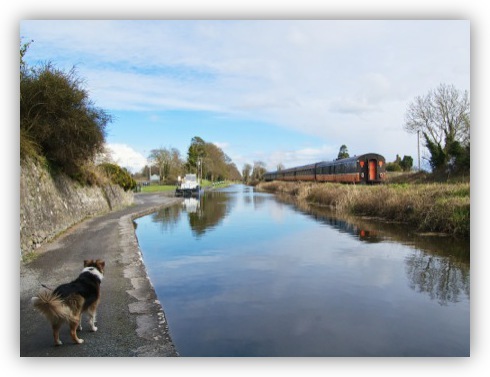 Because there is no longer a turntable in Maynooth, No.186 would be running ‘backwards’ (tender-first) on the return leg. This makes her less photogenic, but still worth shooting IMO. 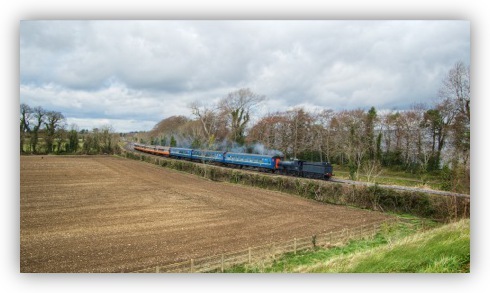 My plan was to set up my main video camera with a zoom lens to capture the train rounding the curves in the distance, and to use the GoPro to capture the wider field of view. I shot some test footage and it looked great, but, as had happened earlier, the sun went away just as the train approached, and this time the wind picked up too – adding a lot of camera shake to the video. 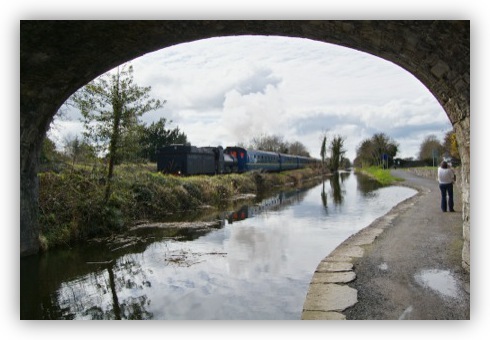 The afternoon train departed Dublin at 2:15pm, and I had planned to meet it at Louisa Bridge in Leixlip, but, at the time I would have had to leave for Louisa Bridge it was raining heavily. By the time the rain stopped I only had enough time to get as far as Donaghmore comfortably. Having been disappointed to miss the closeup shot in the morning, I decided to have a second try at it, and to experiment with a different point of view for shooting my main shots as well. Once again, the sun went away about 30 seconds before the train arrived, but, I did get my closeup shot this time! For the final shot of the day I’d planned to move to the 13th lock near Blakestown level crossing, but once again the rain interfered with my plans. I could see a very heavy shower on the horizon, so I decided to shelter under Pike Bridge, and to try to capture the train from there, using the bridge as a nice frame for the shots. I set up my D5100 on my tripod to shoot video, turned around to set up the GoPro for a reverse view, and heard a bone-chilling clatter. The bridge had acted like a funnel, amplifying the strong gusts of wind, and blown my tripod over. The D5100 didn’t survive it’s fall. After uttering some choice expletives, I set the GoPro up on my main tripod, and captured some usable footage anyway. I always try to choose the location for my final shot of any steam special shoot such that it allows me to get a shot of the train heading off into the distance. The nice thing about bridges is that they have two sides, so as soon as I captured the train approaching the bridge I turned around ready to get the final ‘off into the distance’ shot. Conveniently a dog stopped just in front of me to watch the train, so despite the poor light, I really like my final shot of the day.